The Surface Pro 3 has been out for a while now, but it’s quite expensive for the mass-market. So Microsoft decided to unveil the Surface 3 tablet today (sans the “Pro”). This is basically the successor to the Windows RT-powered original Surface and Surface 2, but it no longer runs that little-used iteration of the OS – and it no longer sports an ARM processor. This time, Microsoft is pairing an Intel Atom x7 with ‘full’ Windows 8.1 (upgradeable for free to Windows 10 when that launches), so the Surface 3 will run any Windows app you throw at it – including the full version of Office, of course. That rectifies what were probably the biggest downsides to the RT-powered Surface tablets of the past. The new Surface 3 comes with a 10.8-inch 1,920×1,280 touchscreen (with 3:2 aspect ratio), a quad-core 1.6 GHz Intel Atom x7-Z8700 processor (with burst up to 2.4 GHz), an 8 MP rear camera, a 3.5 MP front-facing unit, a microSD slot, a full size USB 3.0 port, a mini DisplayPort, Wi-Fi 802.11ac, Bluetooth 4.0, and a battery rated for 10 hours of video playback. For $499, you’ll get 2GB of RAM and 64GB of built-in storage. Shell out $100 more and you have 4GB of RAM and 128GB of storage. There will also be an LTE-capable version, which starts at $599 with 2GB of RAM and 64GB of storage, and goes up to $699 for 4GB of RAM and 128GB of space. 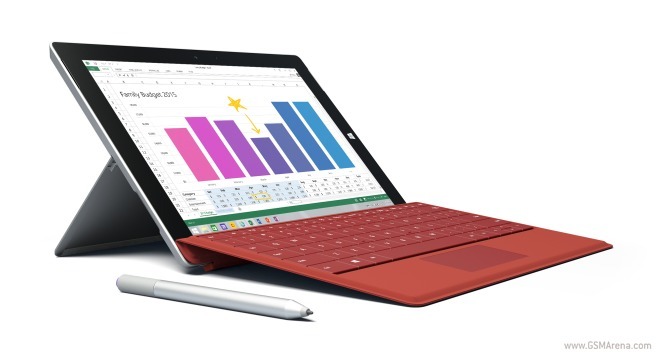 The Surface 3 charges via microUSB, and it has a built-in kickstand like all the Surface tablets before it. Its dimensions are 267 x 187 x 8.7 mm, and it weighs 622g. It’s made from a magnesium alloy with ceramic finish. Accessories for it include the Surface Pen (which will cost $49.99), the Type Cover keyboard ($129.99), and a $199.99 docking station (which comes with two USB 3.0 and two USB 2.0 ports, a mini DisplayPort output, and an integrated charger). The Surface 3 will be showcased in physical Microsoft stores starting tomorrow, April 1. It will become available in the US on May 5, and it will reach 25 additional markets by May 7. All models will come with a free one-year subscription to Office 365. Pre-orders are already available at Microsoft’s online store. The LTE-enabled variations will also be offered by Verizon and T-Mobile later this year. In the UK, the tablet will launch on May 7 and the prices are as follows: £419.99 for the entry-level Wi-Fi-only model with 2GB of RAM and 64GB of storage, and £499.99 if you want to double both of those. These are already up for pre-order, unlike the LTE-capable iterations. Those do currently have a shipping date of June 26, though, so it may be a while before they are out. Also in the UK, the Type Cover costs £109.99, and the dock is £164.99.